Jaloviina or Jallu is a legendary Finnish cut brandy, which is made by blending cognac with grain liquor. Its production began in 1932 as a cheaper alternative for cognac, and originally this three star grade Jallu had 3/4 of cognac. The Second World War cut luxury item supplies, and in 1940 Jallu had to be replaced by a one star grade, which had a mere 1/4 of cognac in it. During the difficult years the popularity of the drink grew, and has remained relatively high in demand ever since. Ville Valo, the lead singer of a Finnish rock band HIM, has made meatballs served with Jallu sauce popular by announcing them his favorites. The recipe was developed a few years ago in his local hangout, Restaurant Tori in Helsinki. I first tried the recipe a year ago, and both S and I instantly fell in love with the smooth, hearty taste of the sauce. The meatballs are also fine, but its the Jallu sauce that makes this dish so special. It was only a few weeks ago when we went to Tori to try out the original. Their portion is huge: five enormous meatballs with a mountain of mashed potatoes and plenty of sauce. Surely a trucker’s meal, but not surprisingly S didn’t seem to have any trouble finishing the plate. However, Tori’s meatballs were tough and plain, albeit the sauce and the mash were perfectly fine. After our second and third visit to Tori we had to conclude that tastewise there isn’t really a reason to leave home. The following recipe is really that good. Mix the meatball ingredients, and roll into 12-16 balls. Bake for about 30 minutes or until just done. Heat the butter and add the flour stirring constantly until nicely browned. Don’t let the flour burn. Add the demi-glace and water stirring vigorously, trying to avoid lumps. Add the beef fond, and let simmer for 30 minutes stirring occasionally. After the 30 minutes add liquor and cream, and let settle for a couple of minutes. You can either add the meatballs directly in the sauce (tastier), or if appearances are more important (boring), serve the meatballs and the sauce separately. Serve with hot mashed potatoes and crushed and sugared lingonberries. Garnish with fresh parsley. Another nitpick on the measurements: 2 dl of demi-glace should be 0.8 cups, I guess? Ripa: I guess you’re right; 1 dl of flour might be too much for the amount of water. I actually like the sauce more than the meatballs, so I simply add water until the consistency feels right. The browned flour has a nice taste to it if let to simmer for 1+ hours. But if in hurry, simply use less flours or substitute with Maizena or similar. Thanks for posting this…another Scandinavian favorite of mine! I tried a Finnish meatballs recipe before, and although yummy, the sauce did not sounds as luscious as this! Brandy…oh my! Tied?ttek? voisiko Blogilistan haamup?ivityksille tehd? jotain? Pid?n blogistanne mutta on varsin ?rsytt?v? ?, ett? Blogilista ilmoittaa jatkuvasti, ett? blogianne on p?ivitetty, vaikka viimeisin postaus on t?m? marraskuinen. OK, I have to try the Cognac sauce it sounds delicious. Love the blog. M? oon NIIN kaivannut Torin jallupullia ulkomailla ollessa ettei mit? ?n rajaa! Pakko p??st? heti testaamaan, mutta voisitko kertoa uusavuttomalle mit? on demi-glace? I now understand how the Finns get through those long winters!! 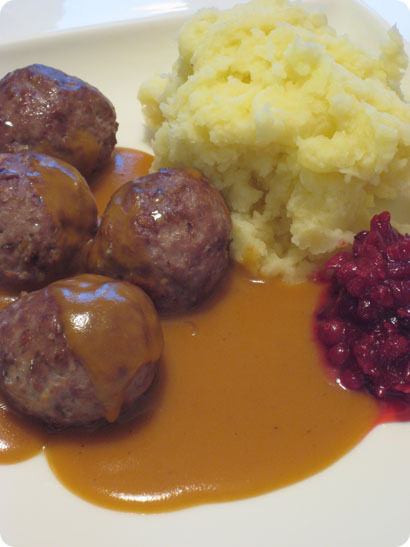 My wife is of Finnish ancestery so I asked her to make me these meatballs last weekend. Unfortunately, she had just pulled a double shift at the Correctional Medical Center (she’s a RN) and ended up drinking most of the brandy during the 30 minute simmering while we ate some crabmeat appetizers and watched Meet the Press. We ended up using a hit of marsala with some Grey Goose vodka. 2 cups seemed like a lot at first, but we ended up really enjoying the sauce. And the meatballs. The meatballs look delicious. I have a similar receipe too at http://yemekzevki.net/2007/10/10/patates-puresi-domates-soslu-top-kofteler/ but I did not translated it into English yet. I’ll post it to my English blog as soon as possible. I made these as part of Christmas Eve dinner last year, they were a hit with the family, everyone loves meatballs and gravy but ones made like this with this sauce, fantastic! I’ll be making them again this year.